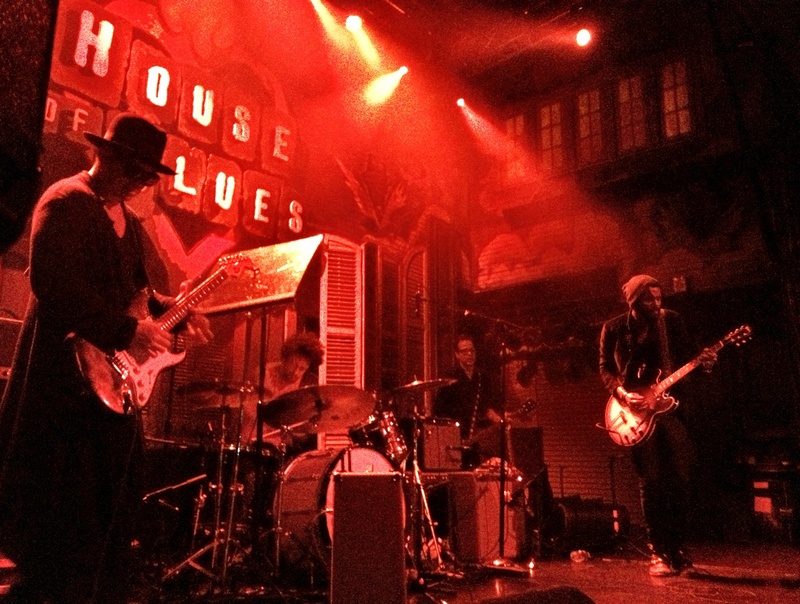 On Monday night in New Orleans, the House of Blues was graced with the presence of one of the next generation’s blues guitar heroes, Gary Clark Jr. Clark, who spent his years learning guitar in Austin, Texas, was preceded onstage by fellow Texans the Moeller Brothers, both bands lending a similar southern blues rock sound to a sold-out room of ears. Having witnessed Clark rip through a handful of outdoor festivals, locals were excited to see him at a more intimate venue. Clark opened the evening on with one of his most popular songs, “Ain’t Messin ‘Round (Give it Up),” the upbeat debut track from his 2012 album Blak and Blu. Four songs in, the slow, gritty sounds of “When My Train Pulls In, “ got the crowd hooked as Clark dug deep on an Ephiphone axe for an entrancing minutes-long Hendrix-induced solo. The tune showcased just one of Clark’s many influences; minutes later it was a rendition of Albert King’s hit “Oh Pretty Woman,” on which Clark and rhythm guitarist Eric King Zapata traded riffs.Shadowing the eclectic track layout of Blak and Blu, Clark integrated lighter songs based in soul and R&B into his heavy guitar-laden repertoire, the focus being Clark’s smooth vocals and lessons in love, though those songs didn’t seem to be highlights for either Clark or his audience. Clark ended the set with the radio “Bright Lights,” a crowd favorite, and encored with “You Saved Me,” followed by “Numb,” sending the crowd home with what they came for, which was Clark’s heavy fuzzed-out guitar and deep vocals.The band’s music was rivaled only by its fashion sense, which could only be more Austinite if it were barbeque-scented: trench coats, sunglasses, bowler hats, dark-rimmed glasses, beanies, angel-wing jewelry and lots and lots of black abounded. More than one of Clark’s female admirers felt compelled to throw articles of clothing onstage, including one scarf which Clark donned for a few moments before placing it in the pile on the amp behind him. Maybe he thought John Varvatos wouldn’t approve, but I thought it fit him well.